Pachomius was raised in a non-Christian family and like many of his contemporaries and peers he was taught to view the Christians as subversive radicals in need of suppression and, at times, extermination. He had been taught that strange mixture of hatred and fear that can only be the product of a social program designed to vilify a largely unknown, "problem-making" group. As was the habit of Rome, there was a conscription movement sweeping through Egypt near the date Pachomius turned twenty years old. Being an ideal candidate for forced service in the Roman legions, Pachomius was picked up and carried to a nearby prison where he could be held in preparation for his forced servitude to the empire. He did not want to fight or make war but it had been determined by the powers-that-be that he would be willing to shed his blood as a down-payment on imperial dreams and aspirations. Being held in a prison against his will--not as a prisoner but as a conscripted soldier--led Pachomius to a painful kind of desperation until one day he was visited by Christians bearing food and blankets. They gave these costly gifts away to the soon-to-be-soldiers and said they did so because their Lord loved all people and taught his followers to do the same. Pachomius was struck by this simple act of charity and pity and vowed to investigate the Christian way of life when he finished his forced servitude. 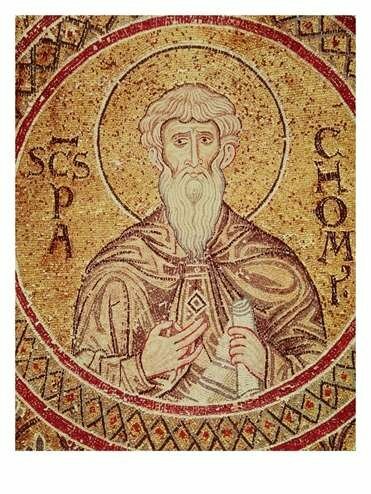 Luckily for Pachomius, he had a very uneventful time of service in the Roman military. He was released after only two years and in obedience to his earlier vow--and the now demanding memory--he sought out some of the hated Christians to learn of their way. In only a matter of time he was converted to the Christian Faith which promised that the way of life led through the way of death and that resurrection was in the power of their Lord. He learned the way of radical love and reckless charity that had first gathered his attention and now understood more fully why they had reached out to him in the first place. After his baptism he spent a significant amount of time learning his new found faith and devotion. After nearly three years in study of and service to his Lord he sought out an ascetic and monk and hermit named Palaemon. This study prepared him to become a Christian leader and teacher and he took to Palaemon's teachings and rigors with eagerness. He learned the life of a hermit and monk from Palaemon for seven years before one fateful night when he heard a voice.The voice--which Pachomius knew to be the voice of God--told him to build a community for hermits. This was a ludicrous idea at the time because the very substance of the eremitical idea was to forsake community for solitude. But Pachomius was not one to argue with a divine command or his own calling. So, he set out to build a community for hermits. Pachomius was the first monastic to call upon other Christians and monastics to live in community with each other and share all of their possessions. Though it must have been slow at first, Pachomius' community grew quickly and was soon filled with monastics who were devoting their lives one to another and joining together as one Body to serve their one Lord.Pachomius wrote a guide for how a monastic should best live the life of prayer and service within the community. This became known as the rule of the monastery and it maintained the social cohesion of the people gathered together. The monastics began calling Pachomius "abba" (father) and this became more of a title than a moniker after some time.This is where we get the word abbot for the spiritual overseer of a Christian community. Soon the monasteries were expanding throughout Egypt. As each one filled up, they would send out a small group of missionary monks to travel and establish another monastery with another abbot or abbess. When Pachomius died in the year 348, there were nearly 3,000 monasteries throughout Egypt. Over the next generation it continued to spread and left Egypt until it numbered nearly 7,000 monasteries.